Hard to make a recommendation here because this comparison will largely be determined by mouse size preference, the DeathAdder is a wider and taller mouse than the Rival 310. Shape wise both are very competent, the Razer DeathAdder has a very comfortable shape that helps the mouse handle despite its large size. The Rival 310 is no slouch either, both mice are very comfortable. The buttons feel better on the Rival 310, less mushy and much snappier of a resposne. Both mice feature flawless sensor, draw. 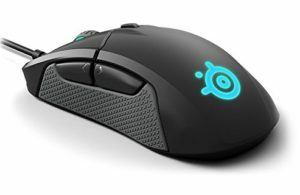 The Rival 310 is much lighter than the DeathAdder while also having a much lighter of a cable, the Rival 310 will be an easier to control mouse because of this. If you don't have a size preference I'd recommend the Rival 310, it's almost the same size, has a comfortable shape but is much lighter (and cheaper).